TEAM Industries has in-house heat treating capabilities at three separate facilities; TEAM Audubon, TEAM Andrews and Motek - TEAM Industries. 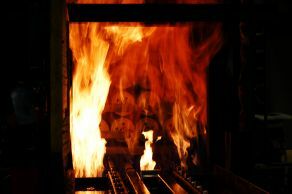 Complimented by our corporate metallurgical lab, as well as two additional in-house metallurgical labs and degreed metallurgists, TEAM is ideally equipped to provide the heat treating solutions you need. 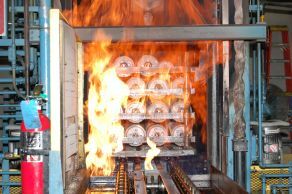 Carburizing or case hardening is a heat treatment process that produces a surface which is resistant to wear, while maintaining toughness and strength of the core. The process involves diffusing carbon into a low carbon steel alloy to form a high carbon steel surface. 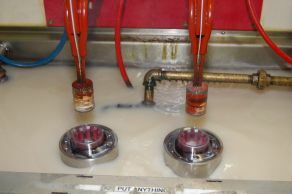 Gas nitrocarburizing or gas nitriding is a case-hardening process whereby nitrogen is introduced into the surface of a solid ferrous alloy by holding the metal at a suitable temperature in contact with a nitrogenous gas. Induction hardening is a form of heat treatment in which a metal part is heated by electromagnetic induction and then quenched (cooled rapidly). The quenched metal undergoes a martensitic transformation, increasing the hardness of the part. Induction hardening is used to selectively harden areas of a part or assembly without affecting the properties of the part as a whole.